A crisp palette pleasing salad. 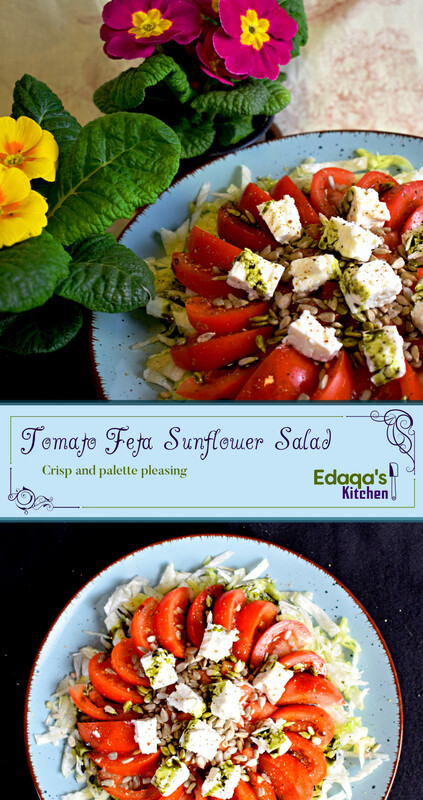 The crisp iceberg lettuce lets the feta cheese take center stage, all set against a backdrop of fresh tomatoes. Rounding off the dish with a nutty flavour is a bit of pumpkin seed oil and a handful of sunflower seeds. When looking to make a salad, I saw nothing but feta cheese and tomatoes in my fridge. 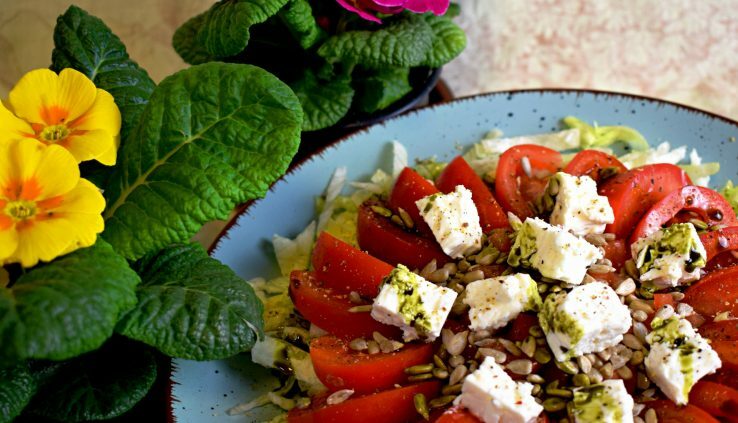 These ingredients tend to pile up as I always buy tomatoes while shopping, and continually think I need another piece of feta cheese. I wanted to create a salad that accentuated these two. I knew the feta cheese would dominate the tomatoes, and I Wanted to ensure nothing else drowned it out. I often find that cheese and tomato salads lack texture, so I opted for iceberg lettuce here. It provides some crispiness without imparting any new strong flavours. The choice of pumpkin seed oil was paired with the sunflower seeds. That feta cheese really deserved a bit of a nutty edge. I like limiting the amount of pumpkin seed oil. Otherwise, the salad would become dark and a bit unappetizing — also why I chose a white vinegar. I think if you had extra ripe brilliant red tomatoes, and stuck with the greener lettuce, you could get away with more of the oil. Of course, if you don’t need to present this, then perhaps a darker, yet bolder, salad is called for. I did a bit of slicing and dicing for the tomatoes. This was mainly to get some structured pictures out of it. But, you’ll want to keep some larger tomato pieces to provide a nice contrast to the strong feta cheese. You don’t want a soup of tomato bits. Now, grab a fork and start eating. Chop the lettuce and put it in the mixing bowl. Dice or slice the tomatoes and add them in the mixing bowl. Dice the feta cheese and add it to the mixing bowl. Add all remaining ingredients to the mixing bowl.